The Kamp-Rite Oversize Tent Cot is a custom fitted tent which can work for different purposes. It is a versatile tool that can be set within few seconds and can also dismantle in few seconds. We all know that while camping, setting up the tent and to pack down the tent is actually a hard task to do. If these two things can be done easily, then there is a lot more to enjoy at camping. We believe that this Kamp-Rite Oversize Tent Cot is the perfect solution for this. This product has got huge popularity among its users. To find out why, please continue reading our full detailed Kamp-Rite Oversize Tent Cot Review. 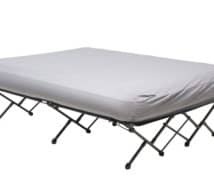 The Kamp-rite Oversize Tent Cot has a sleeping area of 32” by 90”. So you can understand this is not for a large group. 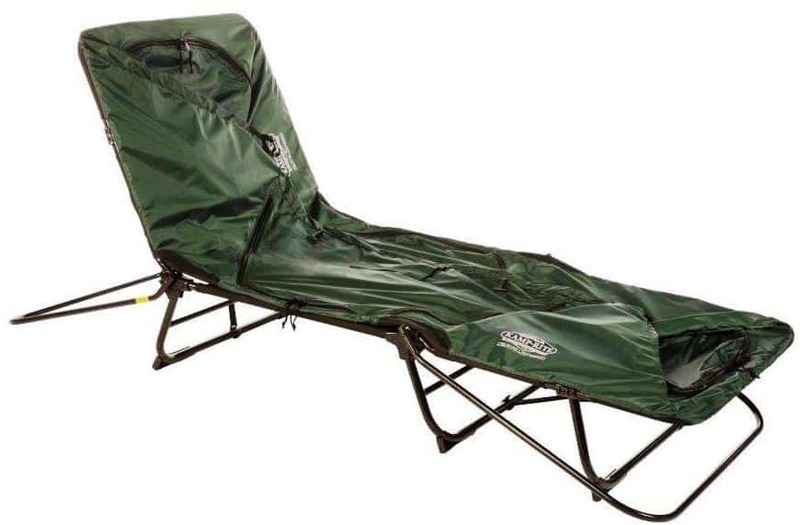 This tent cot is suitable for 1 adult and for 1 child, maximum 2 adults. If you want to enjoy your holidays with your baby, this is something you should go for. There is plenty of room to be comfortable and to move around easily. Moreover, the height and length of the cot tent are suitable for the tall person. A 6 feet tall person can easily sleep inside of it with fully extended arms. This amazing product has a very sturdy and durable frame structure. The frame is designed in such a way, that it stands 11 inches off the ground. The frame construction is very well stable. There are strong straps under the cot that give the perfect stability. One cool thing about the Kamp-rite Oversize Tent Cot is that it can be used as a chair also. We must say that the construction is made very uniquely. It can be laid down straight and use as sitting arrangement. The upper frame of the tent can be reversed toward the ground and then it can be folded down as a cot. So you can even actually use this as a simple cot inside your house also. Lastly, for the well-designed construction, it can be fitted nicely into any car. So, it is really easy to carry from place to place. Still, now we were only talking about the cot part only, now let’s focus on the tent. The tent of the Kamp-rite is also very well-designed just like the cot part. It has two doors along with two large sized zipper windows. The doors are one long side, whereas the windows are on shorter sides. So you can understand there is a very good air circulation system inside the tent and for that it is perfect for hot days. The windows are actually so large, that you can actually use them as doors also. This makes the tent easily accessible from every side. All of these windows and doors are nicely equipped with zippered mesh which will protect you from against. With this tent comes cot you will have proper ventilation plus insect protection. The top height of the tent is 210 D. There is also a tape sealed rain fly which will keep the rainwater away from the tent. Moreover, with this tent, you will get a foam insulating pad. This foam pad is good enough for moderately cold weather, but don’t depend on it too much if there is excessive low temperature. Lastly, the size of the tent is 36x32x90 inch which is a standard measurement of a good tent. The top of the tent is in a domed shape. For this reason, you will get enough room to sit up where you don’t need to touch the roof. 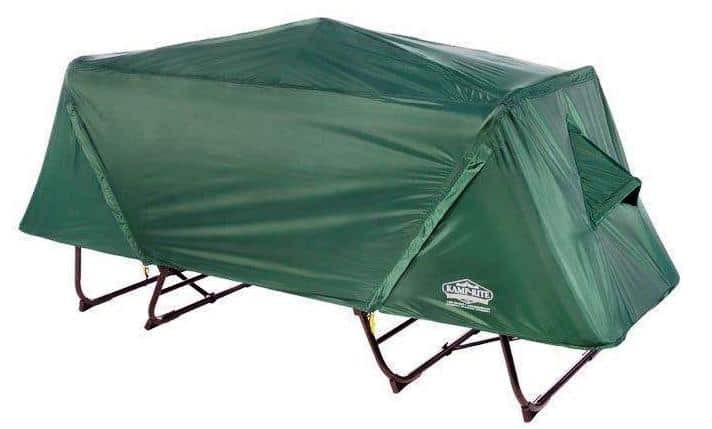 This creates a perfect place for reading books inside the tent. With some tents, it is really difficult to change clothes inside the tent. Therefore, you might need another separate changing tent. However, for the domed top, it is also very easy to change clothes inside the tent. We have already mentioned that the Kamp-rite Oversize Tent Cot is a product of quick set up. Apart from its good design and product quality we really think, this is actually the best thing about this product or you can say the real benefit which has made it different from others. You will fall in love with this product at the very first time for this feature. It will take less than three minutes to set up the whole thing. As the product name says, it is an oversized tent cot, but still, this takes much less time. Rather than setting up, the more difficult part of a camping is to unfold the tent again. The Kamp-rite Oversize Tent Cot does this part also pretty good. You don’t need to push it harder or have to struggle to roll it into an undersized bag. The carrying bag is perfect in size. Because of its size, when folded it is yet too large to store. Again for the size, very heavy in weight. Q: Does it have a rain cover? Ans: Yes, it comes with a rain cover. Q: Does it come with a pad? The Kamp-rite Oversize Tent Cot has got some amazing reviews from its users. 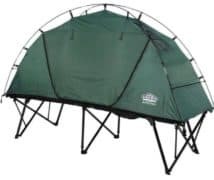 This is a perfect tent cot when you go for exploring the nature. Though it suggested it is for 2 people, but we think this is actually one of the best tents for backpackers. There is plenty of room for one person. This is not a product that you will use for casual camping, it is for extreme ones. 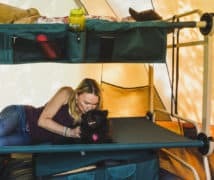 Therefore, we think though the size and the weight of the Kamp-rite Oversize Tent Cot is a problem yet it is highly recommended. It is great for car camping mainly. All in all, we can say that this is a quick, comfortable tent cot with lots of amazing features. 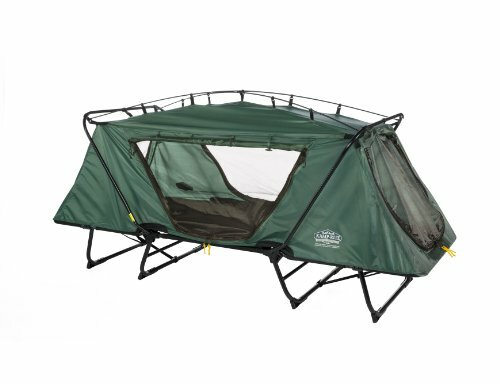 If you love to explore and a grown man who is strong enough to carry the weight you will definitely love the Kamp-rite Oversize Tent Cot.